Canadian book blogger who owns more books than she can fit in her room. Typically reads YA but has a soft spot for Science Fiction and Fantasy, so she carries those around with her as well. Reads while drinking tea, curled up in a little ball for maximum warmth. Sabrina: **Stands up to shake hands** Hello Jamie! It is such a pleasure to have you as my June blogger of the month! Jamie: I’m not too interesting, to be honest. I obviously like to read or else I wouldn’t be blogging and this takes up a lot of my time, especially with three blogs to maintain. I also watch a lot of anime and TV shows, especially Brooklyn 99 and Community. I am a fan of characters so TV shows really have this as an outlet for me. Otherwise I really like hockey and soccer and watch those religiously. 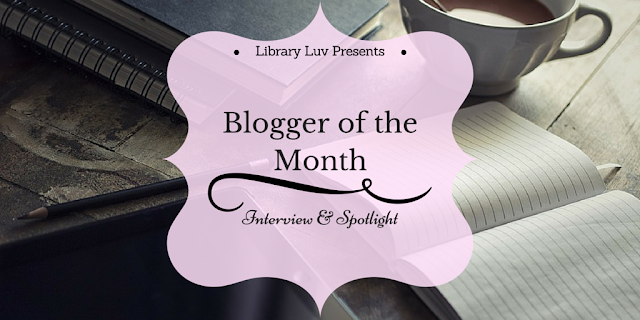 Sabrina: Since this is an interview focused on your blog and blogging experiences, how did you decide that you wanted to take up blogging, specifically book blogging? Jamie: I kind of forgot about Goodreads for a bit after I signed up in 2011 (for like 4 years) but I was reading and saw someone on Facebook using it so I signed into my account. I was looking at other people’s reviews, saw they were blogging, and thought “I could do this.” I did some research about platforms, what it actually entailed, googled some book puns to create my blog name, and signed up. Since then it has just been coming up roses. Sabrina: Which five blogs to you actively read and follow? Tea & Titles. This is a blog run by Ely and Michelle who are both lovely. They have such interesting posts and are always looking for ways to highlight new books and books they love and I really enjoy seeing what they come up with. Emily Reads Everything. This blog is run by Emily and she is 1) great and 2) amazing. She has a Twitter Chat Calendar which I regularly use and she has a feature called “Awesome Indies” which shines a light on indie authors which is always good. Bookiemoji. Crystal and Jenna are both awesome people and run an AMAZING blog. Their reviews are always on point and they both bring so much goodness and light to the book community. I want to be like them when I’m a real adult. Chasing Faerytales. Mishma is literally the nicest person ever. Not only is she hugely obsessed with Victoria Schwab like I am, she is also a leader in making the bookish community, me included, more aware of diverse books. We need more people like Mishma in the community. She also co-blogs on APerfection Called Books with Rachel and Julia. The Candid Cover. Olivia is literally the best. She has such great insight when writing her reviews and I love seeing her fangirl over books she loves. I always smile when I read her posts because you can tell she puts so much love and effort into her posts and I just aspire to be as dedicated as Olivia is. Jamie: I love doing reviews. I love telling people what I like and don’t like and inspire people to pick up a book. The best feeling is when someone tells me they read a book because they saw my review of it. That is like better than chocolate (okay that’s a lie). Sabrina: I know that you are a part of three blogs, how do you mange your posts and time? Jamie: I’ll have a post about how to get organized for both blogging and reading in July on Books and Ladders so you can learn all my secrets then! But, some days are better than others: Some days I forget where I’m posting; some days I post across all three blogs by accident. It’s mostly about balance, though. I have two great co-bloggers, Nicola on Queen of the Bookshelves and Dani on Books Are My Fandom, so it is pretty easy. I read really quickly and schedule really far ahead so I never really have to worry about having the content. For me, the hard part is PROMOTING the content I produce because I am usually so far ahead of myself that I forget about the right now. I use Hootsuite to schedule tweets and Buffer to keep a backlog of posts I have already done so I constantly am keeping people in the loop about what I am writing. Jamie: It was officially a year on May 7th, 2016 since I started blogging on Books and Ladders. It’ll be a year on Queen of the Bookshelves in August 2016 and a year for Books Are My Fandom in January 2017. But I was always a part of the “community” even when I wasn’t blogging. I followed Kristen (http://www.myfriendsarefiction.com/) before I started blogging and was actively involved with keeping up with new releases and all that. It was a pretty easy transition from “reader” to “blogger” for me because I was reading 100+ books a year BEFORE blogging. Now it has just increased since then. Sabrina: Where did the idea for BAMF (Book are my Fandom) blog idea come from? Jamie: Dani from Dani Reviews Things , Iris from IrisJexx , and I decided to start Author Services including proofreading and beta reading as a group and that slowly migrated into being THAT plus a co-blogging experience for all of us, although Iris is on a hiatus right now so it’s just Dani and me running BAMF right now. It’s been really helpful to have another outlet for features because I can use BAMF to focus on promoting authors through our Pro Talks and Where Are They Now? features and use Books and Ladders and Queen of the Bookshelves for reviews and discussions. Plus Dani is my best friend so it is great to be able to do this with her. Sabrina: What are a few tips you would give to book bloggers who are just starting? Jamie: Most of my “tips” revolve around branding and time investment. Your blog is how you communicate to the book community whether through reviews, discussions, memes, etc. If you are only putting in 10% effort, you won’t get 100% result. I spend about 5 hours a day working on posts JUST for Books and Ladders; double that and you are close to what I spend A DAY working across all three of my blogs. If you don’t put in the time and effort, you aren’t going to get results. This is a hobby, yes, but it is also something to be proud of and put 100% of yourself into. And on top of this, your blog is your brand. You want people to be able to recognize you and your blog for something positive. I know a lot of people know me because of two things: 1) I can read REALLY quickly and 2) the Air Awakens Series by Elise Kova. While the first one is just because of interacting with people on Twitter and having them see that I start a book and three hours later am done, I also like to maintain this “image.” Before you start blogging, think about what you want to be known for and DO THIS A LOT and have people NOTICE you do this. Realize, though, that this works both ways: if you are always negative in some respect, i.e. always posting negative reviews, always complaining about something or the other, THAT is what people will remember about you. It is your space to say and do as you like, but remember that other people can see it and therefore you should think about how you represent yourself and your blog. Jamie: ALL OF THEM?? I think at this point, it would probably be IVORY & BONE by Julie Eshbaugh. I really liked this one and thought it was such a unique writing style and concept. I was really lucky to be able to read this one early and I will definitely push it on people when I have the chance. Jamie: I play the piano and could have gone to university for it but chose to study something else instead of music. Sabrina: It’s been super fun interviewing you Jamie! Thank you for sitting down with me today and giving us some insights on you and your blogging. I can’t wait to read more of your amazing posts! Jamie: Thanks so much for having me! I really enjoyed answering these questions and giving some nuggets of insight into my blogging.